If you love to travel but don't want the parking problems and high fuel costs that come with driving a full-sized recreational vehicle, a Chevrolet travel van might be a great option for you. What Is a Travel Van? You've probably heard of conversion vans, which are vans that have been transformed to meet the specific needs of the owners. If you do a lot of traveling and want your own home on wheels, consider a conversion van that is designed for travel. Travel vans come in a wide range of configurations and styles, but they typically feature sleeping accommodations, seating, and sometimes a bathroom. Some travel vans even include a small kitchen, called a "galley." Conversion vans are usually based on standard vans by American and foreign automakers, and Chevrolet is one of the most popular choices. The Chevrolet Express, which has a base price of around $25,000, makes an excellent starting point for a travel van. The Express is available with all-wheel drive, lots of great safety features, and a vast amount of cargo space. These vans get better gas mileage than RVs, making travel more economical. When it comes to parking and turning, travel vans are easier to maneuver than large motor homes. Chevrolet travel conversion vans often come with all-wheel drive, which means they are safer to drive than most RVs. Travel vans cost less than motor homes. Travel vans are smaller than RVs, which can mean cramped quarters for the family. A new Chevrolet van with a travel conversion can cost between $50,00 and $75,000, so it may not be in the budget for all families. Travel vans appeal to a select audience, so you may not recoup your investment if you sell the vehicle. You can buy a Chevrolet Express van at any Chevy dealer, but certain companies specialize in converting these vans for travel. Some of the most popular travel van companies are RoadTrek and Sportsmobile. Alternatively, you can buy a Chevy Express from your dealer and hire a local conversion expert to turn it into a travel van. If you're working with an individual, be sure to ask about his or her previous experience and check the references provided. Your local Chevy dealer may be able to recommend a conversion van expert in your area. 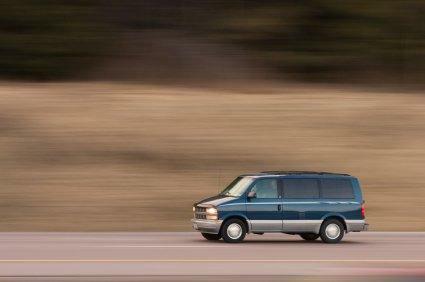 If you're looking for a convenient home away from home, consider a Chevrolet travel van. Many conversion van owners swear that they'll never go back to traveling via car or motor home again.